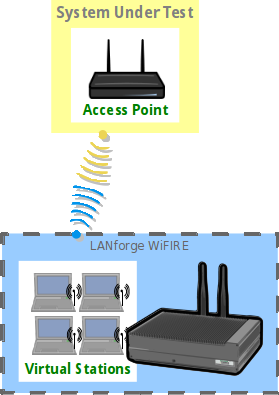 Goal: Setup and run Wireless LAN traffic using the LANforge CT523 in order to fully saturate a WiFi channel. In this test scenario, the LANforge CT523 is used to simulate 4 virtual wireless stations on one radio that associate with an access point on the other radio. This allows a single LANforge machine to be a complete WiFi network. Please see the Wifi Testing cookbook example first. These steps assume the configuration from that cookbook is already in place. Create a virtual AP on wiphy1. Configure the radio's channel (which will apply to the VAP that was just created). Select the wiphy1 interface in the Port-Mgr tab and click Modify. Select the channel, and optionally the country-code, and then press Ok. If you elect to change the country code, you must do so on all radios in your system in order for proper function. 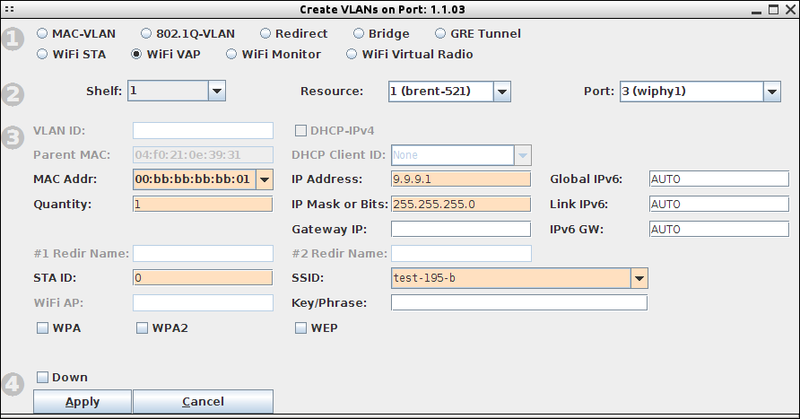 Use the Netsmith feature to create a virtual router and configure DHCP for the AP. Go to the Status tab, and click the Netsmith button for Resource 1. Drag the existing interfaces into a more pleasing layout. Right-Click in empty space and create a new Virtual Router. Just click OK, using the default configuration. 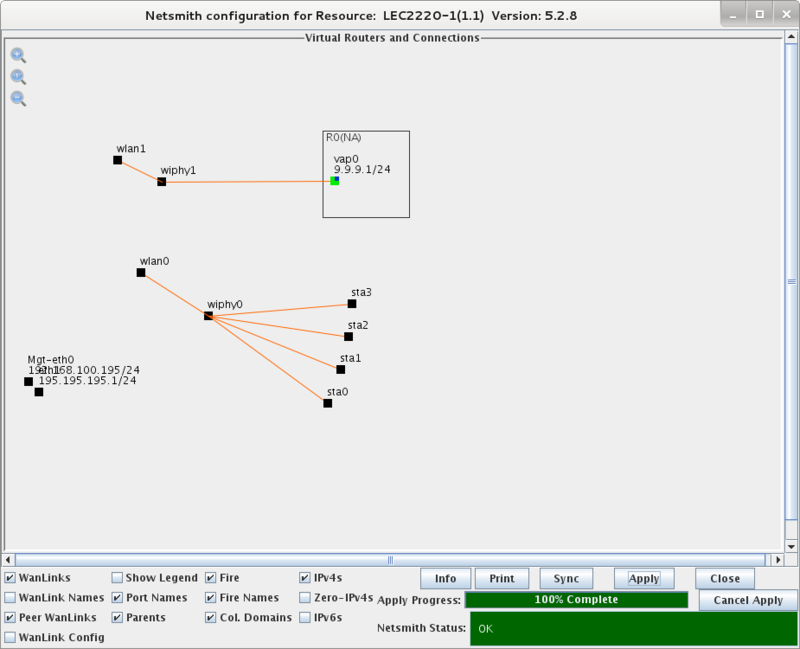 Drag the VAP interface into the virtual router and click Apply at the bottom-right of the Netsmith window..
Double-lick the vap0 icon (which should now be green) to bring up the Create/Modify Connection window. 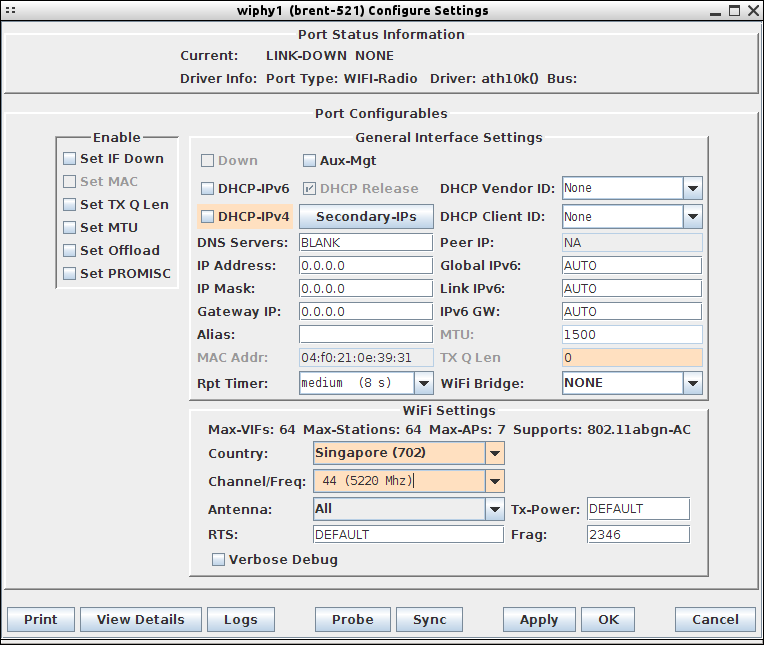 Select the DHCP option, and then fill in the Range Min and Range Max values appropriately. Apply Netsmith again and the configuration should be done. 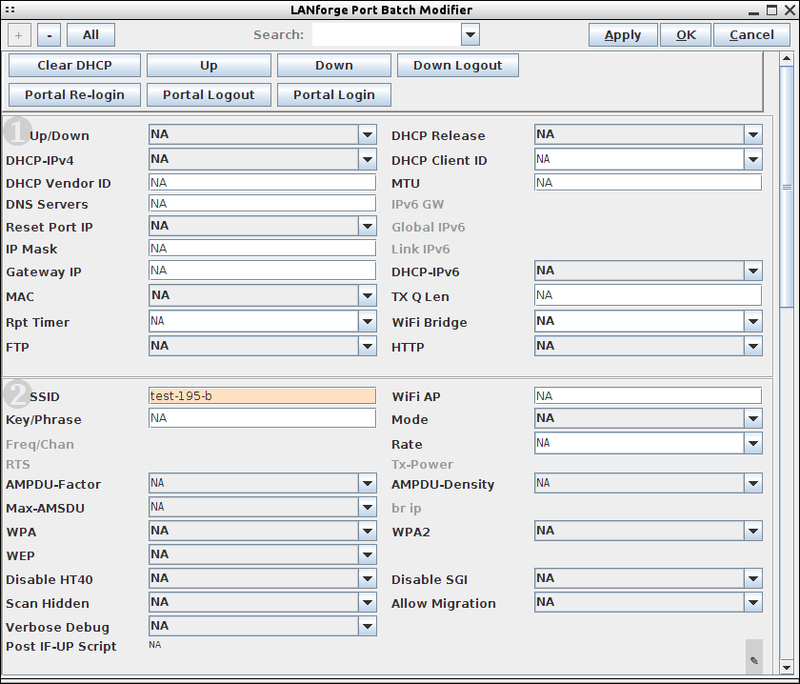 Use Batch-Modify to configure all of the existing WiFi stations to talk to the new AP. Create Layer-3 connections between the station interfaces. Go to the Layer-3 tab. If there are existing connections, stop and/or delete them, and then click Create. 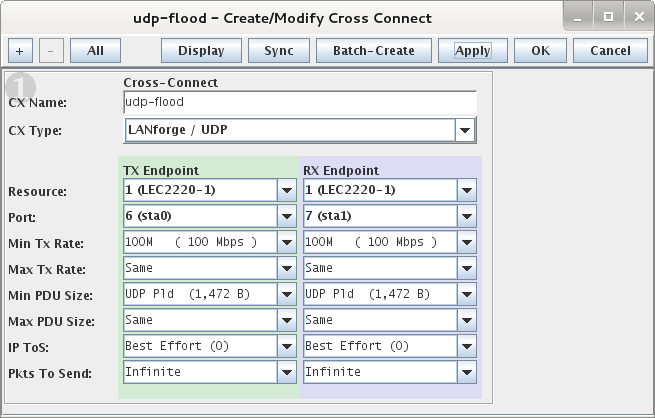 Give the test a name, select sta0 and sta1 for ports, set rate to 100M, and set payload size. When complete, press Apply to create the new CX. Create a second UDP connection on sta2 and sta3 interfaces. 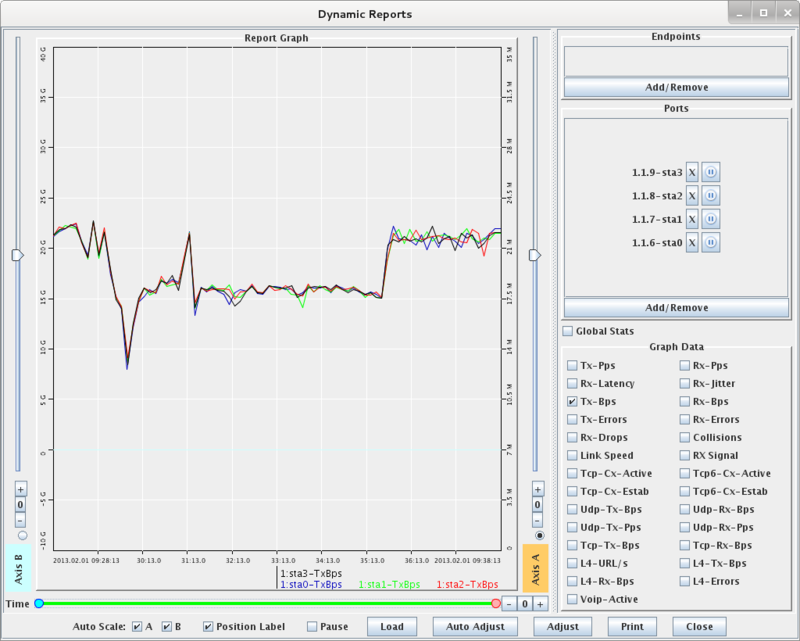 Change name, change ports, and press OK.
Run traffic tests concurrently, and view results. Select both CXs in the Layer-3 tab, and click the Start button. Go to the Port-Mgr tab, scroll to the right, and confirm that the Activity for this channel reports a fairly high percentage. Select the 4 station ports and Right-Click → Dynamic Report on the Port-Mgr table to view a live report of the ports.